In 2003-2004, Brookline Youth Hockey honored a great friend, father, and coach for his commitment and dedication to the children playing in our program. Mike Buckley will forever be remembered for his warm smile, mighty bear hugs, and inspiring ability to make all players and parents feel good about themselves. For those who knew him personally, Mike will always be in our thoughts. He'll continue to bring smiles to our faces when we think about all he has done for our children and the Brookline Youth Hockey program. The Brookline community continues to feel pain at its heart since Buck lost his valiant battle against leukemia in the spring of 2004. But easing some of that pain are the memories of the model Mike was to all who knew him. He knew what was important: the kids. He knew that his duty as a coach was to build up the confidence and lift the spirits of all the players on his roster, not just the good skaters and goal scorers. In fact, Buck went out of his way to single out some of those who struggled the most — pointing out their accomplishments for all to hear. 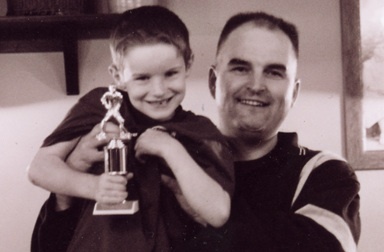 In these days of high-pressure environments where the adults sometimes lose track of what's important, Buck's message and focus continue to ring out loud and clear, serving as a beacon for all those entrusted to coach youth sports. Brookline Youth Hockey dedicated its 2004-2005 season to Mike Buckley, issuing Buck Puck stickers to be worn on the helmets of all participants at all levels in our program, from Ice Mice through Midget travel teams. Today you will still see some players with those stickers proudly displayed on their helmets. But a sticker can't capture the spirit of Mike Buckley — a sense of spirit that we all strive for as coaches and parents and players in the program. Mike taught us all that winning and losing is more a state of mind than anything else. A won-loss record is no way to measure a team or a player. With Mike, it was all about having a great time at the rink and going home with a smile and a story to store away in your memory. Those memories remain in our hearts to be remembered on those days when we all need a lift. Mike Buckley gave all he touched a story or two. A precious memory of what life is all about. Something to hold onto long after the skater outgrows the helmet with the Buck Puck sticker on it. Brookline Youth Hockey will forever cherish those memories and think of Buck every time we watch our players and our children smiling on their way to and from the rink. Each season a member of each BYH Warrior team is selected for the Mike Buckley Sportsmanship Award. This is a player who best epitomizes the traits Mike held so important: Sportsmanship, hard work, dedication, spirit and a team-first attitude. It’s not the top goal scorer because of scoring lots of goals, nor the goalie because he made 50 saves a game. This reward is for the consistent effort and the kid with that unbreakable and infectious spirit.